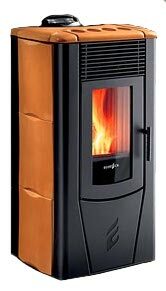 The Ecoteck Monica is a compact pellet stove constructed on a steel frame, with side and top panels made of majolica. Colours available are black, bordeaux, parchment and oriental earth. The 'Monica' is designed to heat up to 1,500 square feet, producing 35,000 btu. This neat little stove has all the Ecoteck features including a humidifier tray and the option of GPRS text message control. Max. Heat Output 35,000 btu. Convection Blower Capacity 140 cfm. Window Size 10.2 in. by 6.3 in. Rear Vent Height 11 in. Construction Type Fabricated steel frame with majolica side panel inserts and a majolica top. If you would like to leave a review of the Ecoteck Monica pellet stove, please use the form on the contact page.